Choose from Blue, Green, Yellow, Orange, Red, Black. See photos tab. 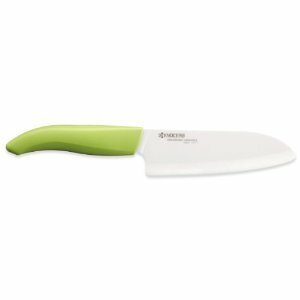 Part of the Revolution series, Kyocera's most popular line, this knife features an ultra-sharp ceramic blade as well as a deeper profile for greater knuckle clearance. It's a great choice for peeling, cutting, shaping fruits and vegetables. And unlike steel blades, ceramic blades will never rust or change from its natural state. A comfortable, ergonomic resin handle in orange provides precise control, while its distinctive shape makes it both easy to find and easy to use. "I love these ceramic tools. Perfect for prep tasks and quick meals, they're the ones I always reach for." -- Ming Tsai, Emmy award-winning chefKyocera has pioneered advanced ceramic kitchen knives, which are impervious to acids, juices, oils and salts, leave no metallic taste or odor, and help maintain the freshness of fruit and vegetables. The razor-sharp blade retains its original sharpness 10 times longer than steel knives. And because the ceramic blade is so light, no artificial weight is added to the handle. This creates an extremely balanced, lightweight tool that reduces fatigue during repetitive cutting tasks. Because diamond wheels are required to sharpen ceramic knives, you should only use the Kyocera Electric Ceramic Knife Sharpener for re-sharpening at home. Additionally, Kyocera offers a complimentary re-sharpening service (shipping fee required; see more below). The Kyocera Advantage The Sharpest Blade Available According to The Cutlery and Allied Trades Research Association (CATRA), an independent testing organization: "Recent tests show that the life of a Kyocera ceramic blade without resharpening is approximately 15 times that of a typical steel blade." Advanced Ceramic, or Zirconium Oxide, is extremely dense, achieving a much tighter weave than any metal material, resulting in the finest and sharpest edge possible. The Most Durable and Strongest Blade Available Manufactured in Japan, a Kyocera knife goes through a 12-step quality-controlled process. Much like a fine cigar, one knife will pass through the hands of over a dozen people from sifting through a rock material to the sintering and pressurizing process that hardens the Zirconium Oxide to the molding, shaping and lasering of the knife. The secret is in the ceramic material, extreme high temperatures and literally tons of pressure; a proprietary process resulting in a superior product. Kyocera has spent over 5 decades perfecting the art of the most durable ceramic available today. It's why other manufacturers want Kyocera either making their ceramic products or they attempt to recreate our products. Complimentary Sharpening Service The only service of its kind available, Kyocera provides FREE knife sharpening. Customers send their knives (unlimited) to our Southern California address, paying only for shipping & handling, to get their knives professionally sharpened back to a factory edge. Each knife goes through a proprietary 5-step sharpening process on a diamond wheel and diamond belt since diamond is the only material harder than zirconium oxide. Chefs and customers get their knives back in 7-10 days as sharp or sharper than out of the box. (For more information, download and print out this form.) People love this service. Kyocera also has an Electric Ceramic Knife Sharpener available for at-home refreshing of Kyocera ceramic knives. About Kyocera Kyocera Corporation, the parent and global headquarters of the Kyocera Group, was founded in 1959 as a producer of advanced ceramics. Kyocera has become a leading supplier of advanced ceramic to several industries including: housewares, medical, aerospace, solar power generating systems, telecommunications equipment, electronic components, printers, copiers, semiconductor packages, cutting tools and industrial ceramics. During the year ended March 31, 2010, the company's net sales totaled 1.07 trillion yen (approximately USD11.5 billion). The company is ranked #554 on Forbes magazine's 2010 "Global 2000" listing of the world's largest publicly traded companies.